St Helens scrum-half Luke Walsh is looking forward to playing alongside close friend Travis Burns next season. 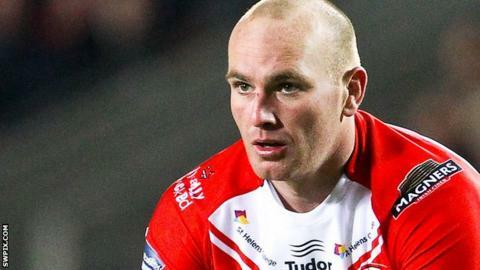 Burns will join Saints from Hull KR and the 30-year-old will link up again with Walsh, after their time together at Australian NRL side Penrith Panthers. Walsh, 27, is missing from Saints' play-off run after he broke his fibula and tore ankle ligaments in July. "I'm looking forward to Travis coming and I think he's going to be great fit for the team," Walsh said. "For everyone out there, I'm definitely 100% coming back [to St Helens]." "We had about three or four years together so we've become really close mates and great mates away from the field so I think that will help our combination." Speaking to BBC Radio Merseyside, Walsh continued: "He's a competitor, a good organiser, has a good kicking game and he's good to have around the club - he's a character who's pretty funny. "Since he's been here [in England] he's had two great years for Hull KR and shown some really good ball skills - he'll add to our team." Walsh should be fit to return at the start of 2015 after initially fearing the horrific injury he suffered against Widnes could have ended his career. The scrum-half will continue his rehabilitation in his native Australia at the end of the Super League season, which had led to rumours that he was moving back to the NRL, but Walsh says he will return to Langtree Park next term. "For everyone out there, I'm definitely 100% coming back," he said.